A marriage between Bourbon and Smoked Chipotle Hot Sauce that spend their honeymoon in Bourbon barrels for 90+ days. 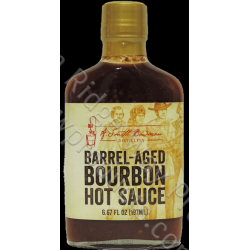 A smokier and hotter sauce emerges and then is bottled in a 6.67 oz flask bottle. Enjoy this on pork, burgers, add it to your favorite baked beans, anything that you would like to enhance with a little spice and smoke.